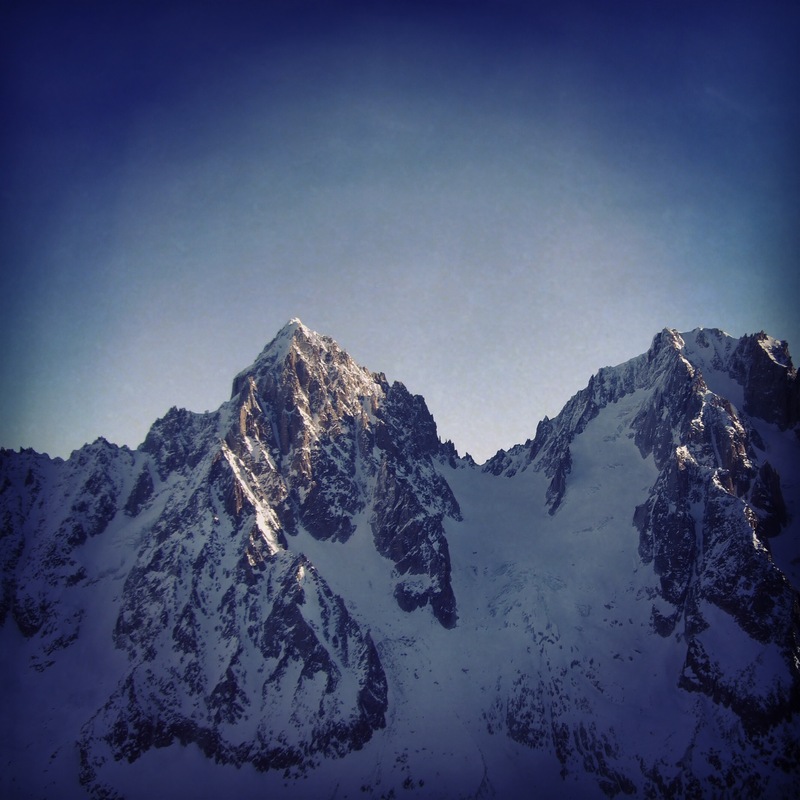 Chamonix is an awesome place where most climbers, skiers and outdoor lovers would love to live there. But unique and amazing also means very crowded. 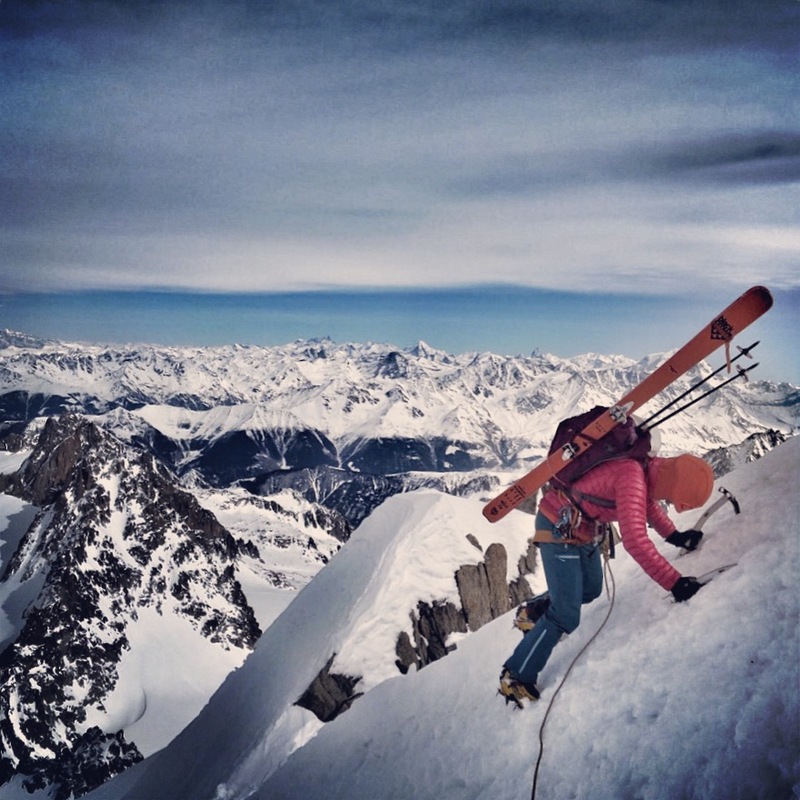 Finding a great place for a climbing or a skiing day without anybody else is sometimes a bit tricky. Where to find a bit of adventure and tranquility when you only got the day? 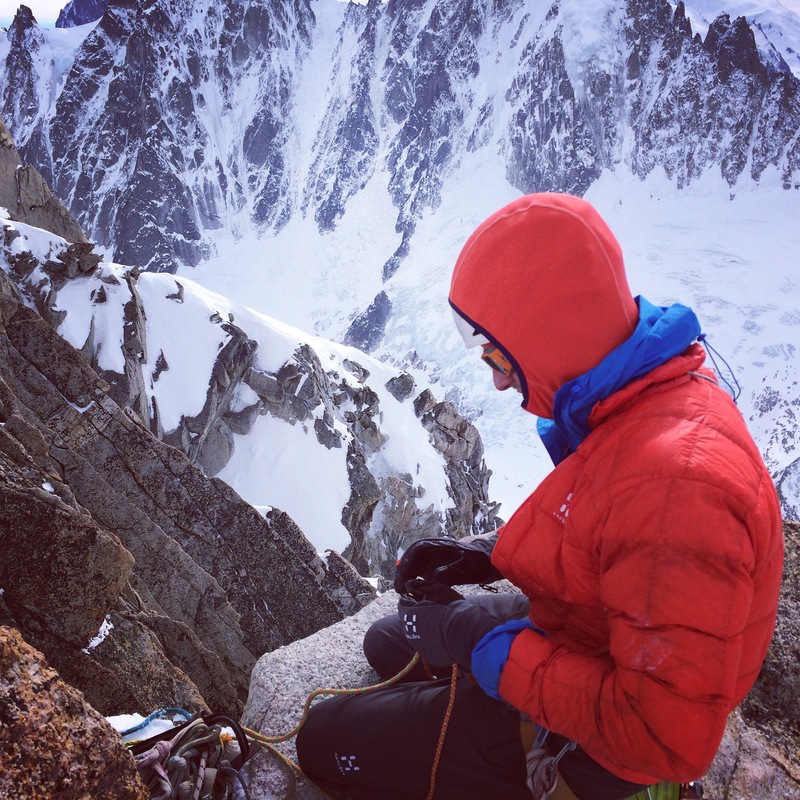 Together with Nils we thought of the Chardonnet peak, a nice summit we can see from everywhere down in the valley and on which none of us had been. 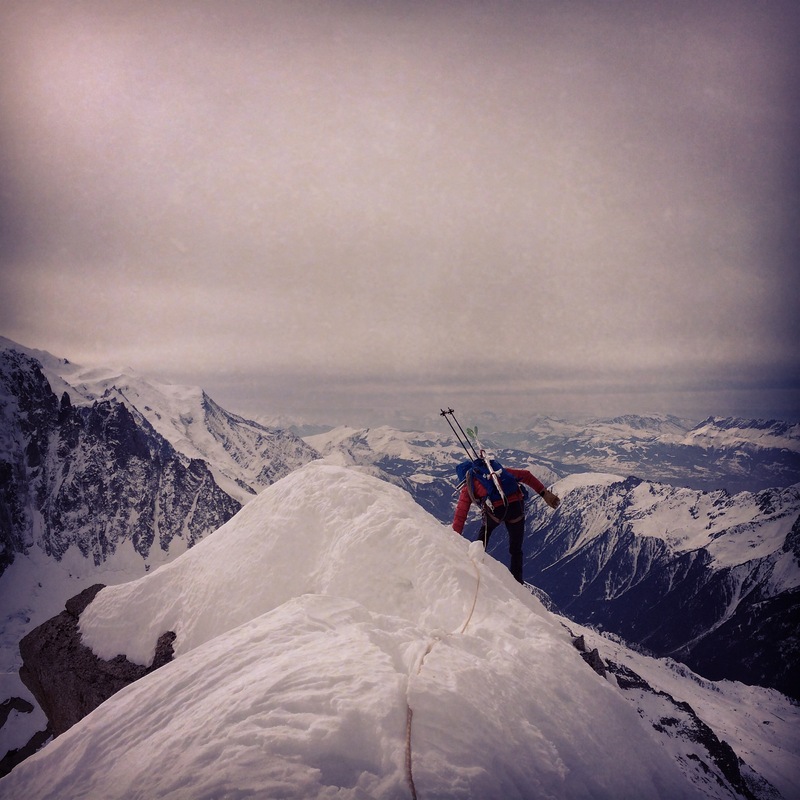 Nils suggested an interesting way to climb and ski it, different that most people do. We got a plan! So here we go, heading to the Grands Montets lift to reach the Argentière Bassin. After the ritual of the bin and the “hard bad” snow to ski down to the glacier we take the direction of the Chardonnet with no one either before or behind us (it will not last, the first groups to the Chardonnet pass will eventually show up… ) All this with an amazing point of vieux on the Verte peak, the Grande Rocheuse and the Droites face. 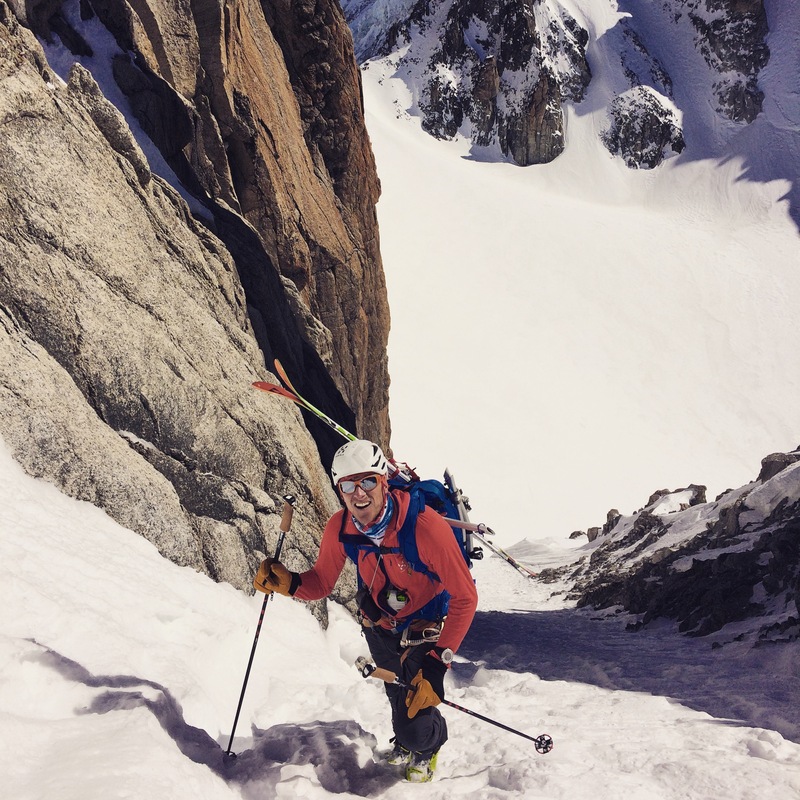 From there, we skin up toward the Chardonnet pass, on a typical spring morning hard snow. 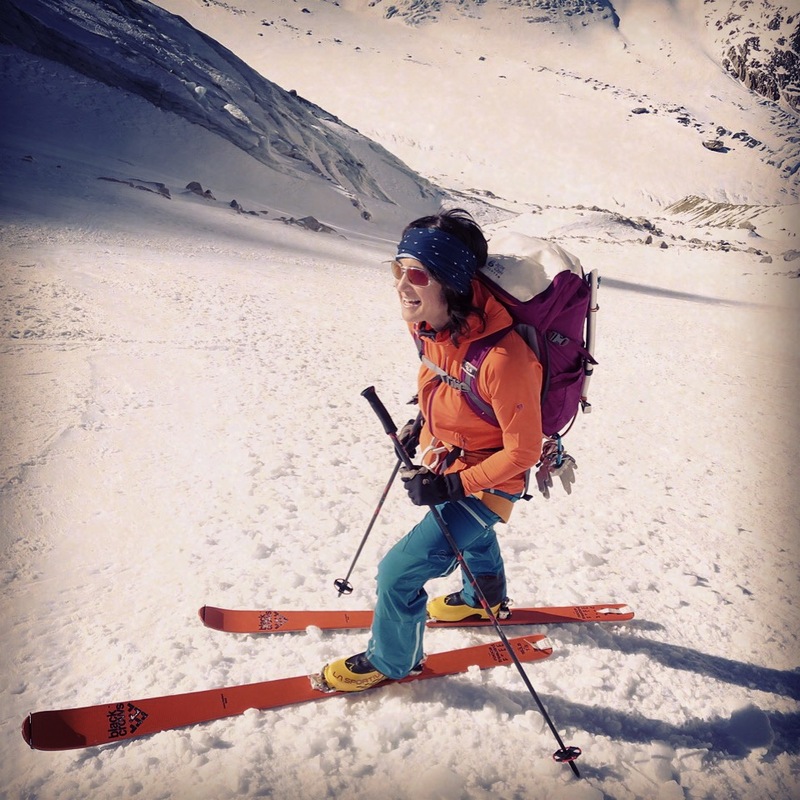 This year, I decided to reduce the size of my skis and the weight of my gear. Except for the few really good powder days, I have done all my alpine days with the Rocca Freebird, 75 under foot, and I had lots of fun and lots of confidence with a small but real ski. Same thing with the boots, I now use the Syborg a lot that weight less than a paire of Baturas… after a few times you get use to ski them just like any bigger boots. 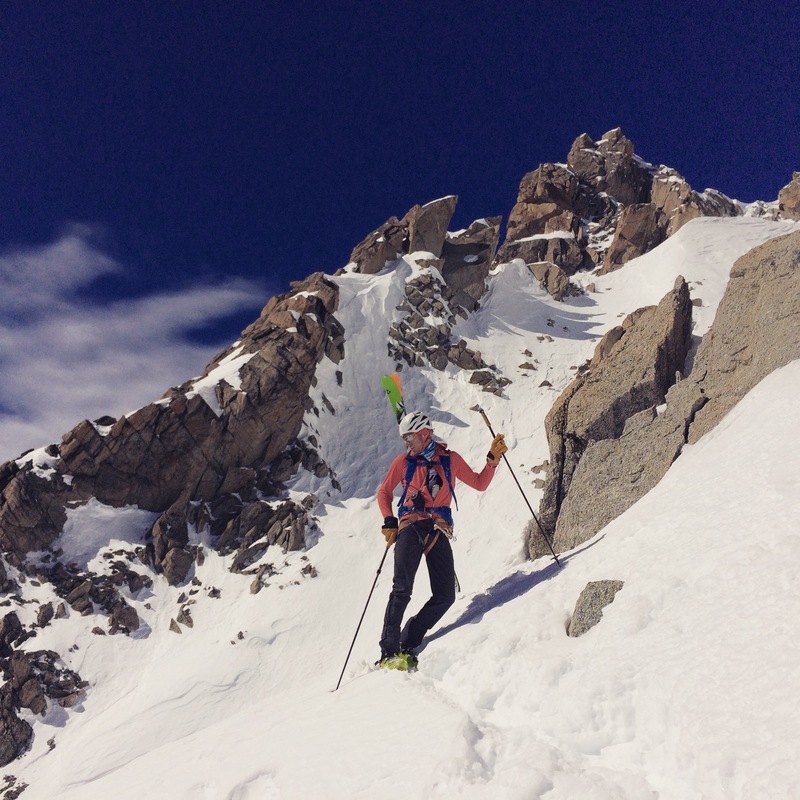 The wind is blowing on the plateau and I’m glad we are getting inside the South-East couloir that seems protected. As its orientation means it, we are in full sun and the snow is already quite wet and heavy. But there is already a good track that makes the ascent easier and we’re gaining elevation at a good pace. 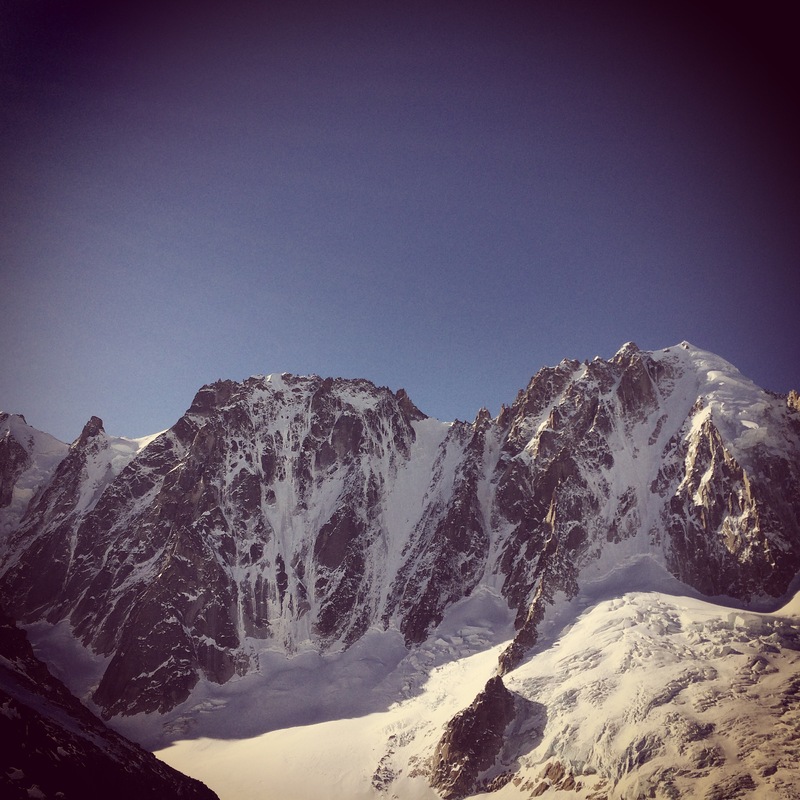 The scenery is very Alpine but friendly, with the white of the snow and the beautiful orange granit. Below are a few pictures of Nils and myself. Those couloirs are always longer that what we believe and that’s exactly how Gaston Rébuffat said, “the already steep terrain straightened again”… It became that steep that we had to get the rope out for the last 20 meters, steeper and with a really sugary snow that made the progression delicate. One small climbing step (or two or three) to get out of there and we finally reach the Forbes ridge. An icy wind greets us at the exit of the couloir and my wet gloves from the hike up in the sun and wet snow freeze in two seconds, taking the closed form of my hands on the ice axes. There is some more sugary snow to climb on the ridge that does not make me feel comfortable. I have to stay concentrated on the feet for the traverse that leads to the summit. The descent is really nice with ridge first, then some snowy shoulders, a bit of route finding, a bit of anchors testing (two abseils to reach behind the Adams Reilly pass). Finally we reach the glacier of the Tour, one last abseil to get away from a big bergschrund and we can ski again! The descent at first still request some attention because of the crevasses but then the terrain get more flat with no crevasses and we can really enjoy our descent all the way down to the village of the Tour. It was a sweet alpine day, a day like I like them! 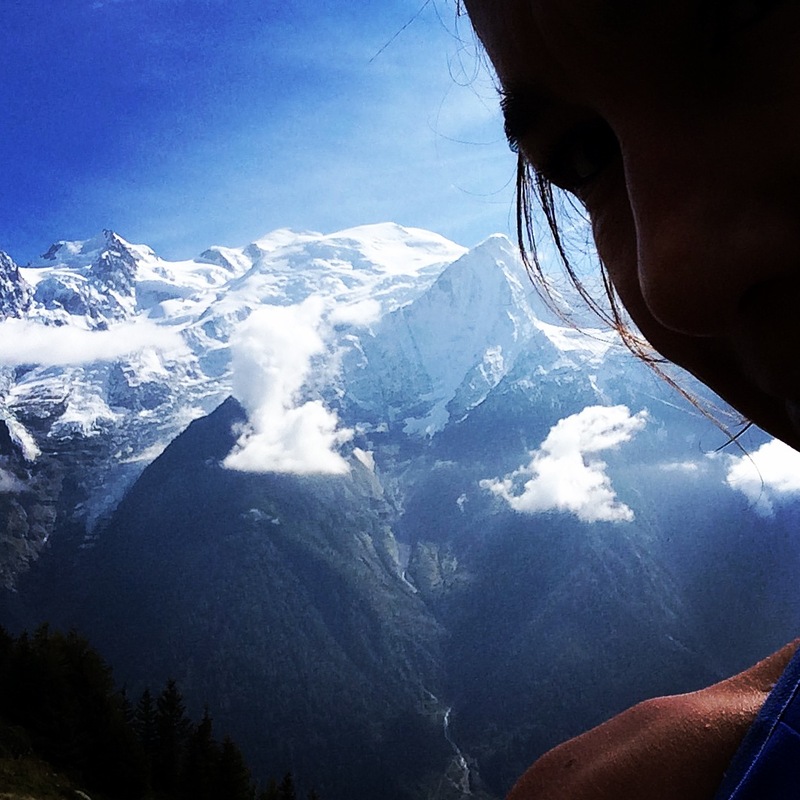 Le Massif de Mont Blanc est un endroit unique, exceptionnel et pour moi toujours aussi incroyable, magique et surprenant. Endroit exceptionnel et facilité d’accès conduisent inévitablement à une grosse fréquentation. Quand on vit dans la vallée, une des difficultés est de trouver une course sympa à faire où il n’y aura (presque) personne. Où trouver un peu d’aventure et de tranquillité à la journée? 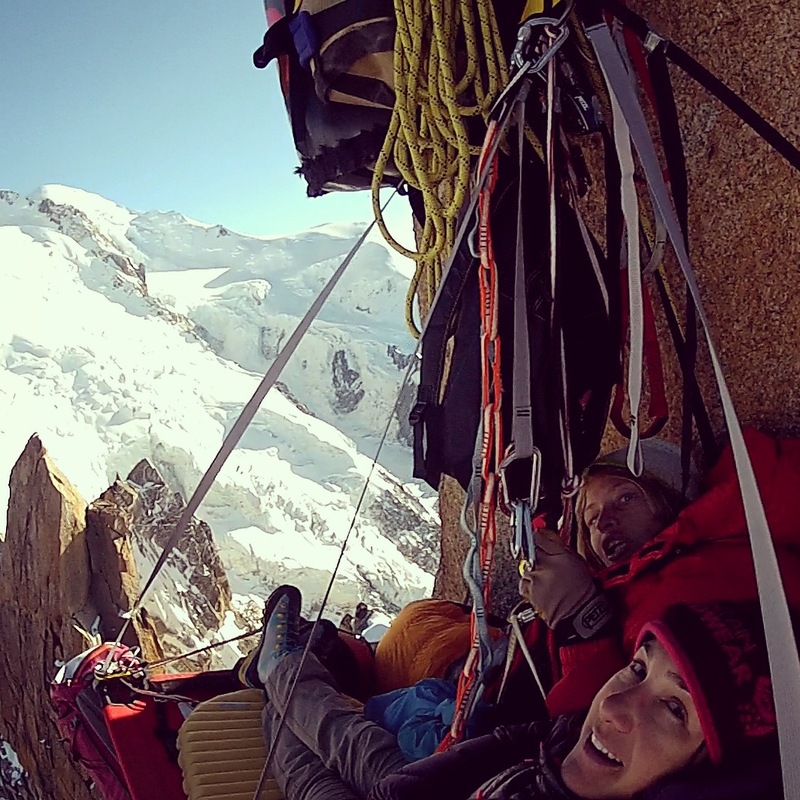 Avec Nils nous décidons de partir sur le Chardonnet, un sommet où nous n’avons jamais été ni l’un ni l’autre et de le faire d’une façon (je crois) peu habituelle. L’idée est de monter par le couloir Sud jusqu’au sommet. De là nous récupèrerions l’itinéraire de descente de l’arête Forbes puis les épaules enneigées orientées Ouest pour finalement prendre pied sur le glacier du Tour, derrière le col Adams Reilly. Direction donc, en ce matin de mars, les Grands Montets pour rejoindre le bassin d’Argentière. 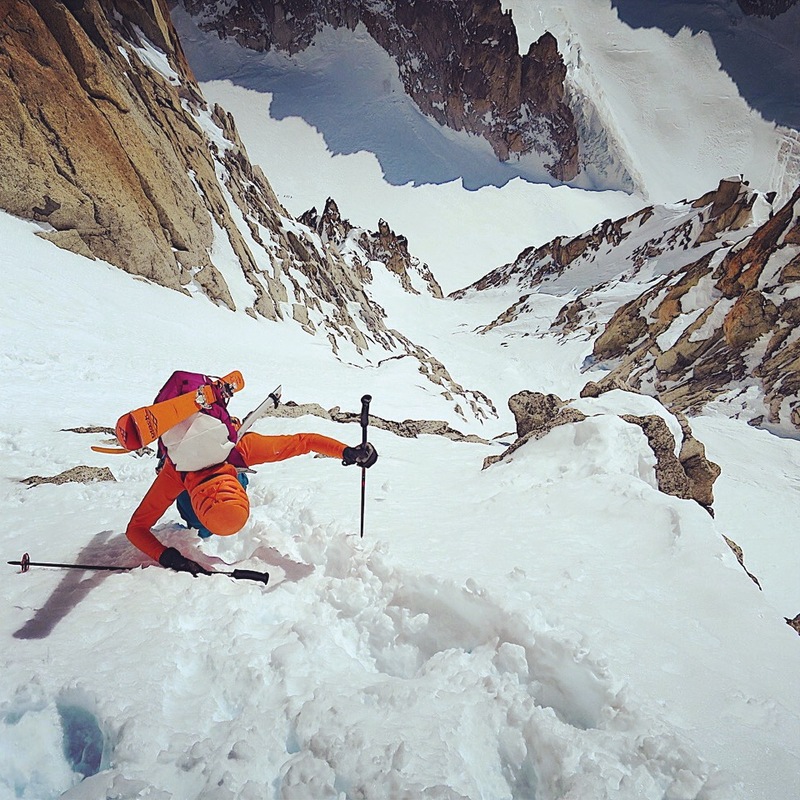 Passé le rituel de la benne et de la neige béton pour descendre sur le glacier nous prenons la tangente en direction du Chardonnet avec personne ni devant ni derrière (cela ne durera pas, les premiers groupes pour le col du Chardonnet finiront par arriver…) et la vue qui va bien sur la Verte, la Grande Rocheuse et les Droites. De là nous attaquons la montée sur neige dure en direction du Col du Chardonnet, en rive droite. Cette année j’ai opté pour redescendre en largeur de ski et en poids de matos. En dehors des quelques belles journées de poudre, je fais l’ensemble de mes sorties montagne avec les Rocca Freebird, 75 au patin, et je me suis régalée, avec un ski, qui skient, tout en confiance. Même chose pour les chaussures, les Syborg pèsent moins lourd que des Baturas… et l’on prend vite le coup de les skier. Le vent souffle sur le plateau et je suis contente d’aller chercher le couloir Sud-Est qui semble protégé. Comme son orientation l’indique nous sommes plein cagnard. Il y a déjà une bonne trace de faite, cela facilite la montée et nous permet d’avaler rapidement du dénivelé. Le cadre est bien alpin, bien sympa, entre le blanc de la neige et le jaune/orangé du granit. Ci-dessous une petite série de photos de Nils et de moi-même. Ces couloirs, c’est toujours plus long que ce que l’on croit et c’est exactement comme Gaston Rébuffat l’a dit, “la pente déjà raide se redressait encore”…. A tel point que l’on a du sortir la corde pour les 20 derniers mètres, raides et surtout en neige sucre qui rendait la progressions délicate. Un petit pas (voire deux ou trois) d’escalade pour se sortir de là et hop nous voilà sur l’arête Forbes. Un vent glacial nous accueille à la sortie du couloir, les gants humides de la montée gèlent en deux secondes et prennent la forme fermée de mes mains sur les piolets. Encore de la neige tout sucre qui ne me met pas en confiance, je reste bien concentrée sur les pieds pour cette traversée qui mène au sommet. La montagne c’est pointu, alors on ne s’y attarde pas pour sortir le thé et les cookies, surtout avec ce vent et les nuages qui arrivent. Nils file devant, je le suis en essayant d’attraper une photo ici ou là. La descente par la voie normale nous amène au premier rappel. 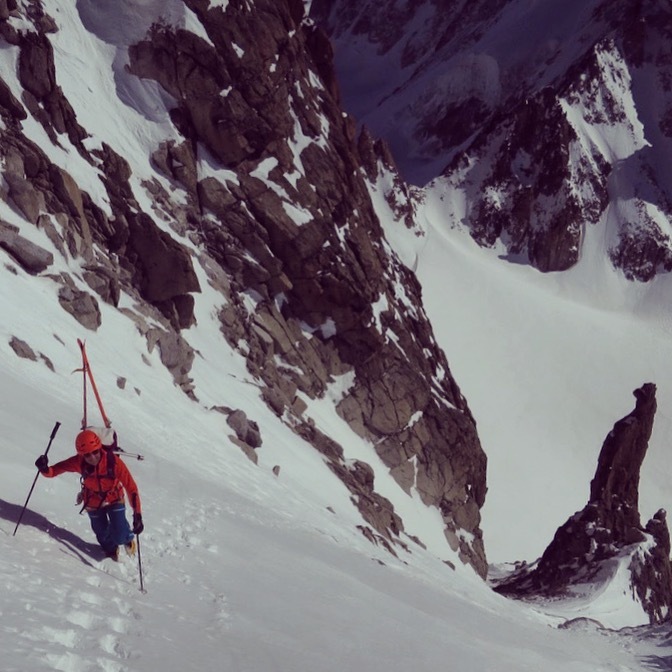 Un second suivra, puis le passage d’une grosse rimaye et enfin nous pouvons chausser pour une descente sympathique jusqu’à rejoindre le glacier du tour et se laisser glisser jusqu’au village. Une belle ballade alpine qui a fait de cette journée une sortie complète en terme de recherche d’itinéraire, de décisions, de manips. Une journée comme je les aime bien. Wishing to everyone a Fantastic New Year, filled with Happiness, beautiful Emotions, true Friendship and magical moments in the Mountains! In 2015 Live, Love and Elevate yourself! The idea was to bivy at the base of the face and climb the combination of the Slovenian route finishing up with the Eperon Croz route. The plan B was to climb the Couzy-Desmaison further right on the Pointe Marguerite if other parties were already on the Slovenian/Croz route. We hiked up on a Friday at lunch time under a perfect blue-bird sky to the base of the face. One other party was already there but we had the feeling we would start before them and did not worry about having them above us on the route. We started to climb at 1:20am and climbed the first two thirds of the route at night. Rémi climbed first through the bergschrund in good style making it look easy. I had no idea until it was my turn how tricky it was. I struggled. I did not like to lose time here at the beginning of a long day. It was only in an unconventional way that I could pass it and we could keep going. Rémi was climbing really fast, completely immersed in his element. I felt a little bad with leading and being slower. But it was great to sea how things can be done and learn from someone with amazing skills. It’s been a few years since I’ve been on the Petzl RocTrip. In fact, it’s been a few years since I’ve really sport climbed at all. This autumn the Petzl RocTrip headed to a string of different locations in Eastern Europe, finishing its happy journey in Turkey. Special thanks to my good friend Jack for teaming up the last two weeks. It’s been good chats, good laughs and great climbing days. I’ll remember for a long time how Jack warmed up on a 7c+ thinking it was a 6c+ and many more hilarious moments. And above all I’m thankful for his catch on an unexpected fall at a first bolt. 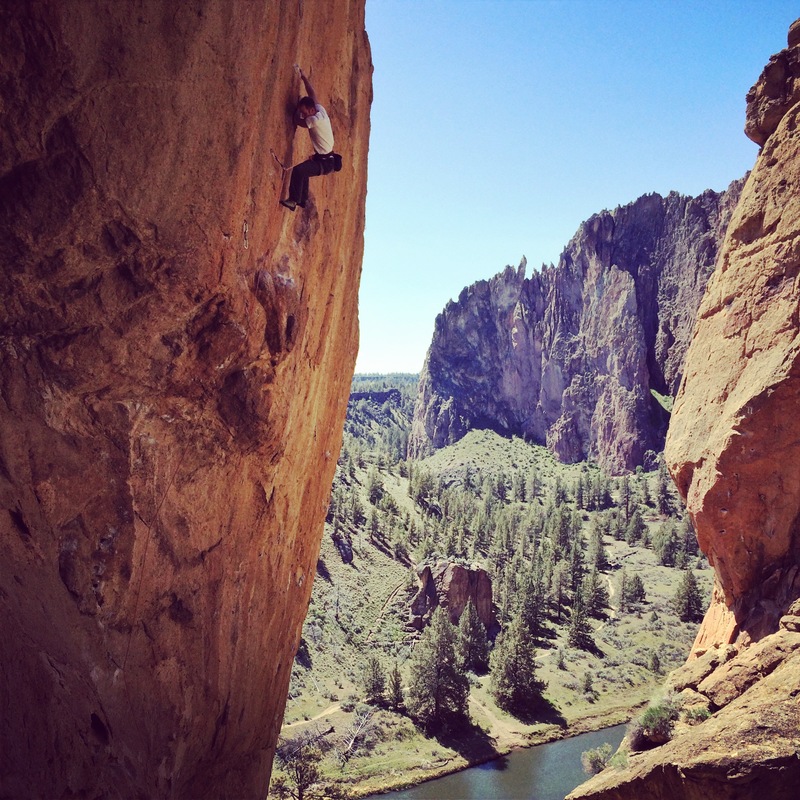 Broken holds can happen anywhere. It was a stark reminder the belayer must always be ready. Massive thanks Petzl for the great organization and all the good times. You guys rock!